That snap is teriffic Travis. I just love it. Although it is different it captures my imagination like one in Daff’s Local Footy Book where the boys are driving home after a game in WA with a big fat Roo on the bonnet to the fire. I can smell the hairs burning and hear the fleas popping and hissing in the flames. Ha ha.. 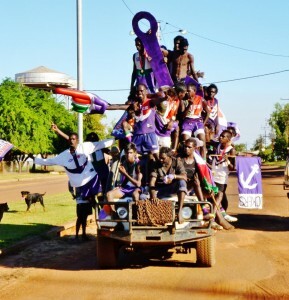 Thanks phantom, I just really love the enthusiasm & pride on the players faces and the innocence they have in thinking 40 people in & on a troopie is appropriate behaviour after a premiership victory.. You can’t tell but the car is painted in dockers colours & has the owners favourite players highlighted.. It sums up the unbridled joy of winning a flag. Credit too for the free Dockers who provide a fair bit of support for clubs prepared to make the sacrifices required to be seen in purple. What a ripper. Such a beautiful photo – one of those definitely worth a thousand words.